I first found Stone Axe a while ago (I'm assuming 2009, seeing as that was when their debut album was out) randomly on one of the websites I peruse looking for what's new and amazing. At the time, I couldn't find any info on the band, no album reviews, nothing at all really (which makes me think it was closer to 2008 and the album was unreleased), and so their debut LP got shelved into my ever growing collection of music. Fast forward to 2010, and I discover their second release, this time with a bit of fanfare and a little about the band out there. But still it wasn't enough for me to get excited and listen to the dual releases, and so it, once again, was shelved. Later that year, I decided to take this website thing seriously and I began listening to new music as fast as I could, and I also began reading more and more websites and fellow bloggers, and I began to notice the name Stone Axe popping up over and over. So, earlier this week, I decided to actually listen to the artist that I have been sitting on for at least two years, give them their time in the sun and the attention everyone seems to think they deserve. Well let me tell you, everyone was right. 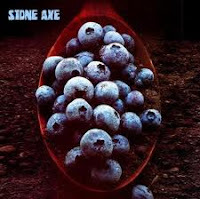 Stone Axe plays a very strong showing of post-grunge mixed in with retro-rock, but with each album taking it's own view of this description. The band's debut, self-titled, album, starts deep within the vein of stoner blues, but with each song, moves steadily into a more traditional hard rock/stoner sound. It all sounds a bit post-grunge, like Soundgarden with a bit more groove, especially within the vocals. The album has some moments when it sounds like Thin Lizzy throughout, especially during the semi-folksy song "The Skylah Rae." This album seems to be where the act is getting it's feet wet, they are expanding their sound and style, experimenting with what they can do. The first song off their newest album seamlessly moves directly from the sounds of the previous - you wouldn't know it was a different album just from listening to it. 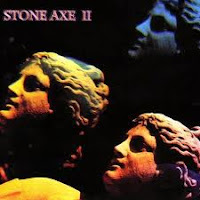 Stone Axe II seems a bit more in the classic rock zone, moving into something more akin to AC/DC, but still keeping the touches of Soundgarden and - depending on the person singing - still sounds strangely like Thin Lizzy (the song "Those Were the Golden Years" more then any other). This album is more varied then the original, but still grounded in the stoner/retro-rock feel of its predecessor. I found myself bobbing my head and grooving right along with the music - it was really easy to write articles (I wrote three within the span of these two albums) with this music playing. The chillness of it all did wonders for the creative process. Well there you have it, yet another band that I wish I had taken a bit of time, all those years ago, to sit down and listen to some great rock. While Stone Axe II wouldn't have been a true contender for my 'Best of 2010' list (it just didn't pop like the ones on the list did) it still would have been a great addition to the year's music collection. The band is a 2 an band. Tony Dallas Reed and Dru Brikenhoff. They describe the band as 70's personversationalist (sp?). Thin Lizzy was a big influence on Tony (he writes and records 99% of the material) thus the sound. Dru's voice is smiliar to Chris Cornell's (thus the Soundgarden reference). Tony's the more softer voice. If you like Tony's singing, he's also the frontman for Mos Generator. Tony is currently writing and recording new material with both Stone Axe AND Mos Generator as well as mixing and producing albums for other bands such as Split Hoof and Blood of the Sun. Great band, great mini review. I don't really hear any grunge at all to be honest, I hear a lot of Free in both albums. The bass tone and the guitar tone is more Kossoff and Fraser than Thin Lizzy to my ears. Skylah rae has definite Free moments, as does "Black Widow" - it could be a Free song! The vocal phrasing even has touches of Paul Rodgers. Not a bad thing at all. I never listened to much Free, which is probably why it comes off more like Thin Lizzy to me. The grunge moments really come off of the Chris Cornell sounding vocals of Dru Brikenhoff (thanks for Buffetbone). A lot of stoner bands get associated with the grunge movement (not that I like grunge at all), coming up as post-grunge or whatever (shoegaze as well, but that is a much more well-defined grouping).